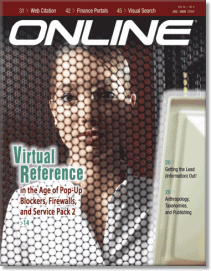 In parts one and two I raised a series of objections to Pascal Lupien's article in Online, "Virtual Reference in the Age of Pop-Up Blockers, Firewalls, and Service Pack 2"
Unlike VR software, IM works with most computers, operating systems, and connection speeds. It does not require the patron to download software or configure a browser. [IM is] faster, as patrons who already use an IM system can simply add the library service to their list of “buddies” and message a librarian when they require assistance. Not only do I find IM to be a perfectly good tool for reference work, I think it is quickly becoming (has become?) a standard mode of communication that every library should consider offering as a point of contact for their customers. Libraries, get an AIM Screenname, get a yahoo ID, sign up for Meebo, (maybe add the MeeboMe widget to your webpage) and start chatting with your customers! But why limit IM to reference? We don't limit the phone to reference, do we? IM is just another way for our customers to contact us. Larger libraries can give each department their own IM identities, (i.e. "extensions") and let the customer choose which department to connect with. If a session needs to be 'tranfered' to another department, library staff can invite the customer and someone from the correct department into a new chat room, and viola! the session has been tranfered. So many of our customers are on their computers all day (and night) it just makes good sense to give them a quick, convenient option for contacting us. Sarah Houghton mentioned multiple librarians need to be able to monitor a single screen name. Jean Ferguson said that she that her campus enterprise IM software (Jabber) doesn't talk to commercial IM networks (like AOL). One final, more personal point before wrapping this up. I'm unhappy with the snarky tone I took in responding to Lupien's article in part one, and I realize it was not productive to take such a tone. It came partly from writing much to late, while far too tired, and partly from my own deep wish for librarians to stay focused on the bigger picture of customer experience, and my perception that the article lacked that focus (whether it did or didn't, dear reader, you may decide.) I am not trying to make excuses for my snarkiness, just offering a little self-reflection from a nascent blogger, tinged with a bit of regret. I will try to do better. I am convinced that Pascal Lupien cares deeply about the vitality and relevance of libraries and the importance of customer experience. I recently found a copy of his presentation, (along with Lorna Rourke) Adding a Personal Touch to a Virtual World, presented at Computers in Libraries, 2006. This presentation gave me a fuller picture of Pascal Lupien's attitudes, concerns, and values and I found myself nodding in almost constant appreciation and agreement with his work. OK, that's all I'll be posting about VR for now. Back to customer service! Books are the new t-shirts. We used to buy t-shirts as a way of covering our hard abs. Now, though, the purpose of the t-shirt is to be a souvenir, to give us a concrete way to remember something that mattered to us—and to give us an easy way to spread that idea to others. ...human beings respond to stories, and stories, the best ones, are personal. No ulterior motive. I rarely do A as a calculated tactic to get B. I do A because I believe in A, or it excites me or it's the right thing to do. That’s it. No secret agendas. I don't think my audience owes me anything. It's always their turn. I'm in a hurry to make mistakes and get feedback and get that next idea out there. I'm not in a hurry, at all, to finish the "bigger" project, to get to the finish line. I do things where I actually think I'm right, as opposed to where I think succeeding will make me successful. When you think you're right, it's more fun and your passion shows through. If you like what you read, check out the rest of the post here, then amble on over to Seth's blog.